The therapeutic paradigm of metastatic hormone-sensitive prostate cancer (mHSPC) has evolved based on the results of three randomized Phase III trials evaluating early use of docetaxel in Westerners. 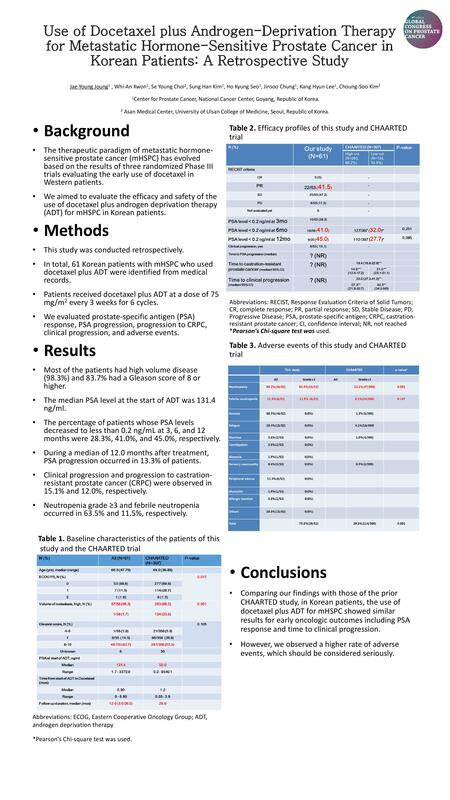 We assessed to evaluate the efficacy and safety of the use of docetaxel plus androgen deprivation therapy (ADT) for mHSPC in Korean patients. This study was conducted retrospectively. All 58 Korean patients with mHSPC initiating use of docetaxel plus ADT were identified in medical record. We evaluated PSA response, PSA progression, progression to CRPC, clinical progression and side effects. Most of the patients were high volume disease (94.8%) and 79.3% (46/58) had a Gleason score of 8 or higher. PSA level at start of ADT was 131.0 ng/ml. Patients received docetaxel plus ADT at a dose of 75mg/m2 every 3 weeks for 6 cycles. The percentage of patients whose PSA levels decreased to less than 0.2 ng / mL at 3, 6, and 12 months were 28.3% (15/53), 41.0% (16/39), and 47.4% (9/19), respectively. And PSA progression occurred in 12.3% (7/57). Progression to CRPC and clinical progression were observed in 12.1% (7/58) and 17.0% (8/47), respectively. However, 63.5% (33/52) and 11.5% of the patients developed neutropenia grade 3 or 4 and febrile neutropenia grade 3 or 4. Comparing with those prior studies, in Korean patients, use of docetaxel plus ADT for mHSPC showed similar or better results of early oncologic outcomes including PSA response, time to clinical progression. However, high rate of grade 3 or 4 adverse events (neutropenia and febrile neutropenia) should be considered seriously.